Krishna dancing on a lotus, c.1825. Gouache on watermarked paper. The Bhagavad Gita, part of the Hindu epic Mahabharata, was composed more than two thousand years ago. In the text, the Hindu god Lord Krishna advises the prince Arjuna about his duty as a warrior and responsible spiritual being. In Professor Ravindra’s new translation and commentary, the Bhagavad Gita is considered as a universal guide to navigating the battle of life. Krishna urges Arjuna to practice yoga, fixing his mind more and more on the essential nature of Krishna, and he promises Arjuna that he will teach him jñāna (sacred knowledge) and discriminative discernment (vijñāna), knowing which nothing else remains to be known. At the same time, he is quite clear that out of thousands of human beings only a few will strive for perfection, and out of those who come to a perfection of character, very few will know Krishna’s real nature. As we look around at the general human situation and see what largely occupies humanity, any notion of striving for spiritual perfection seems very far away and quite rare. 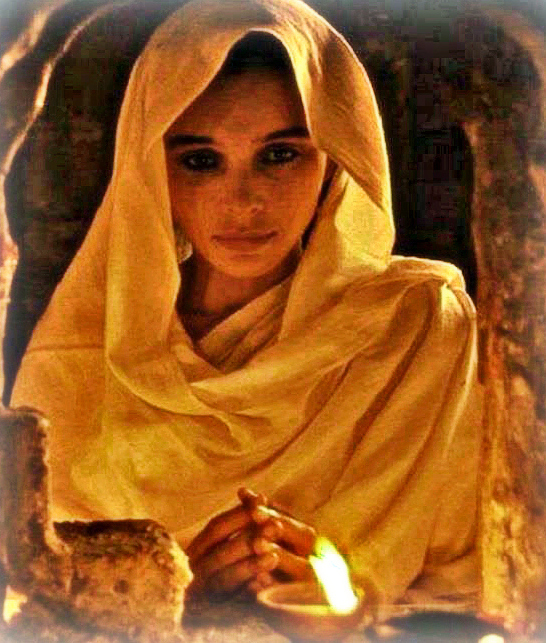 This is not new; even at the time of the Buddha or of Christ, or at the time of Krishna’s human incarnation and before, very few people seem to have had an interest in searching for the Real. Like the author, the readers also need to ask themselves periodically about the quality of their search for the Truth. We need to fully understand love if we wish to fall in love with the supreme love, known as “Divine Love.” Nevertheless, such an understanding is not something that happens outside this world or beyond our space-time continuum. This is because each object in this world manifests the divine and thus, we as individuals can encounter the divine in anything, anywhere and at any time. But once this understanding happens, and it is crucial that it does happen at some point, we come to realise that the divine permeates everything. Thus, one way of defining divine love would be by falling in love with everything, as distinguished from the love of one particular object. But this definition does not sufficiently distinguish divine love from human love and the question still remains: is the nature of divine love (i.e., the love of everything) the same as human love? Once we acquire the realisation that the divine permeates everything, then the nature or mode of our love of the divine changes dramatically. As the object of our love becomes “everything,” the manner of our loving evolves from human to Divine. This is known as enlightenment. Divine love may begin with our loving another person, but gradually our love grows to embrace everything in the world, and as our love encompasses everything, we transcend the norms associated with human love and the manner of loving changes. Janmashtami (also known as Krishnashtami or Gokulashtami) is a festival dedicated to Lord Sri Krishna to commemorate his birth on earth. 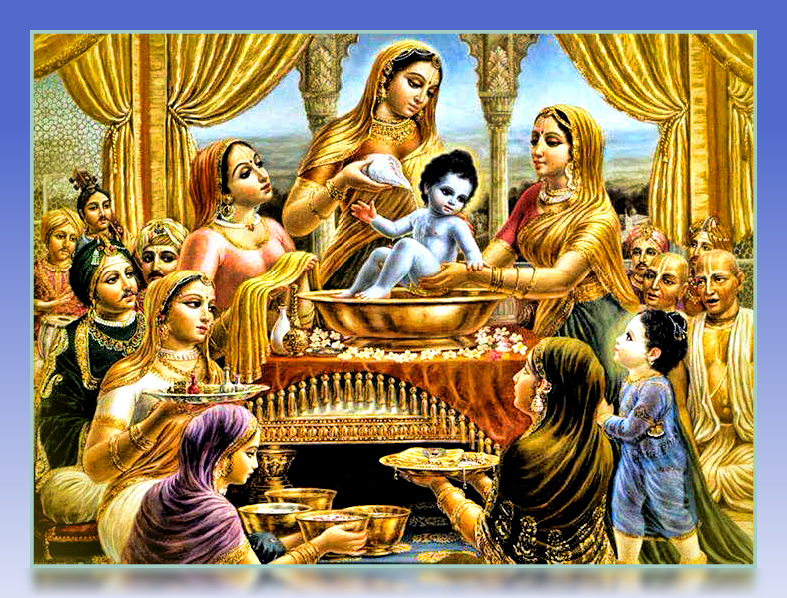 This year it falls on August 17, and on this day (up to midnight), the whole story of Sri Krishna’s birth will be enacted by the devotees in their houses and many delicacies, prepared out of milk and curd, will be distributed as ‘prasad’ (food made sacred by offering to God) to everyone. Since that time of Woodstock, where hippies gathered to celebrate their new-found shining selves (The Shining Ones), we have held a fascination for The Light. This is true of many of us who shunned the Church and its traditional teachings for something more appealing and often found in far flung places. By our thousands we turned instead to the New Age gurus both near and far, to point us towards The Light. Be it in a yoga meditation class, where light meditation ended each class, or while sitting meditating quietly on our own, we rekindled The Light within. We wanted to become the “New Shining ones”, the redeemers of the age. The splendour of that great Being.. Fascinating and awesome as such visions might be, the experience of light ought not be the final goal. If that were so, The Bhagavad Gita would have ended with the Eleventh Teaching. But it does not. According to Krishna Himself, the Supreme state is that which the sun does not illumine, nor the moon, nor the fire, for it is the Light of Pure Consciousness. These worlds are analogous to those found in the Svetasvatara (6.14) and the Katha Upanishad. (5.15). – The Pavamana-Mantras, from the Brihadaranyaka Unipanishad. Link to my new blog with photography. Hope you will visit. “O loved one, show yourself! Your devotees, whose lives are sustained in you, are searching for you everywhere. You are taking our life, O Lord of autumn; your glance excels in beauty the heart of a beautiful lotus perfectly born in autumn from a pool of water. We are your maidservants, we do not ask for any payment. Isn’t this killing us, O bestower of favours? O bull among men, we have been continuously protected by you from destruction from the poisonous water, from the wicked demon, from the winds and rains, from fire and lightning, from the bull of Arista, from the son of Maya, and from fear from all sides. You are not, in fact the son of a gopi. You are the witness of the inner self in all embodied beings. Being, petitioned by Brahma, you become manifest in the family of the Satvatas, O friend, for the protection of the Universe. Place your lotus hand on the head of those who have approached you out of fear of the material world, O foremost of the Vrsni clan. Your hand, which holds the hand of Sri Lakshmi, bestows fearlessness and fulfills desires, O lover. You are the hero of women, and you take away the pain of the people of Vraj! The pride of your devotees is annihilated by your smile! Accept your maidservants, friend! Show us your beautiful lotus face! Place your lotus feet upon our breasts. Your feet have been placed in the hoods of the serpent Kaliya and follow the animals to the pasture. They are the abode of the goddess of fortune, Sri, and they removed the sins of submissive embodied beings. Excise Kama, who dwells within your hearts. O hero, these women obedient to your will are stunned by your sweet voice, your charming words which please the mind and the intelligence, and your lotus eyes. Reinvigorate us with the intoxicating liquid of your lips. Those who repeat the sweetness of your words in this world are munificent. These words are praised by poets, spread abroad, are are auspicious to hear. They are life-giving for those who are suffering. They remove sins and bring good fortune. Your bursts of laughter, pleasing looks of love, and pastimes are auspicious to contemplate. Those meetings in secret places touch our hearts, you cheater, and perturb us thoroughly. When you go from Vraj grazing the animals, O Lord, your feet, beautiful as lotuses, are troubled by blades of grass and corn stubble, and so we feel distress. You are our beloved. You possess a lotus face, surrounded by blue locks of hair which you constantly display covered with thick dust at the end of the day. Your arouse Kama in our heart, O hero. 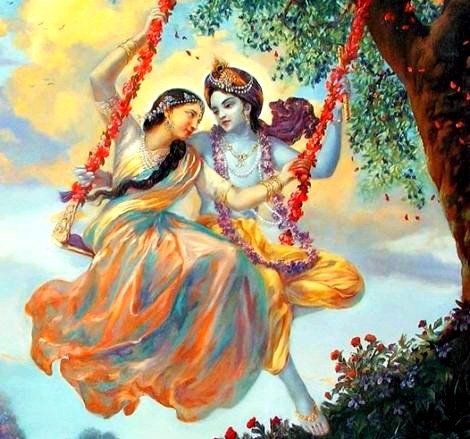 O lover, place your most beneficent lotus feet on our breasts. They fulfill the desires of the humble and should be meditated upon in trouble, O destroyer of anxiety. 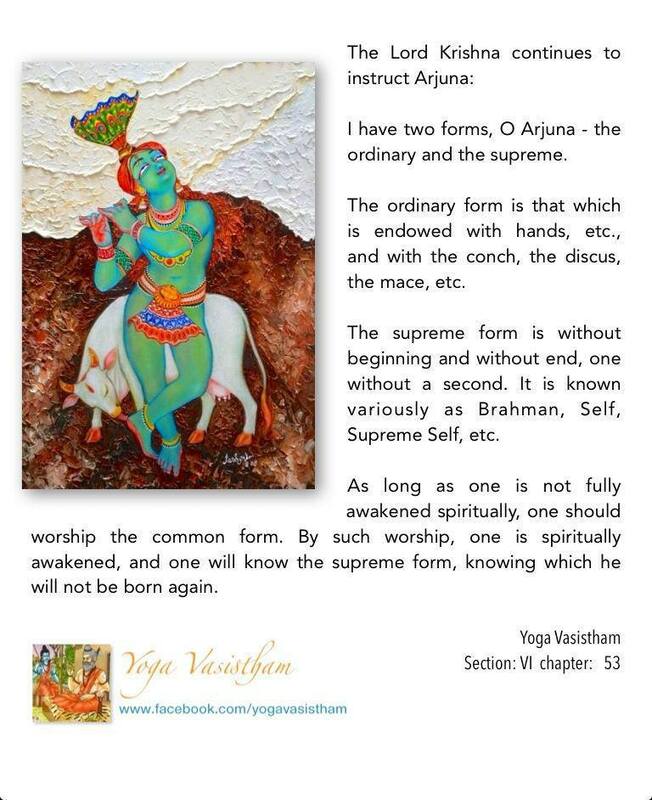 They are worshipped by the lotus-born Brahma, and are the ornament of the earth. 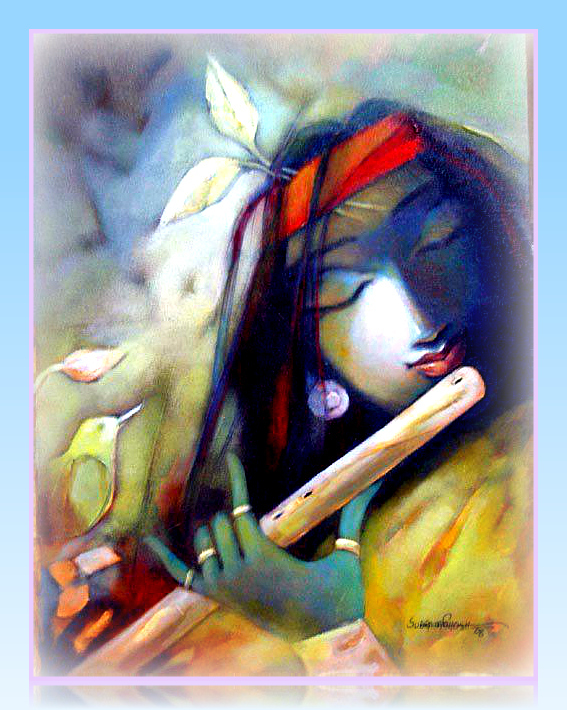 Bestow upon us the nectar of your lips, O hero, which have been thoroughly kissed by the flute as it plays music. It destroys sorrow, increases the pleasures of love, and causes men to forget other passions. When you, Lord, go to the forest during the day, a moment becomes an Age for those who do not see you. He who created eyelashes is dull-witted, from the perspectives of those beholding your beautiful face, with its curled locks of hair. Acyuta, you are the knower of movements. Bewildered by our song, we have thoroughly neglected our husbands, sons, family, brothers and kinsfolk, and come before you. Who would abandon women in the night, you rogue? We have become unsettled from contemplating your broad chest, the abode of Sri Lakshmi, the goddess of fortune, as well as your looks of love, your smiling face and the meetings in secret places which aroused Kama. We long for you intensely all the time. Your incarnation is for the good of the universe, and dispels the distress of the people of Vraj. Deliver a little of that medicine which removes the ailment from the hearts of your devotees to us. Our hearts yearn for you. Krishna’s Song is a deeply profound piece of writing. I like the translation into English and feel it deserves a place on this blog. 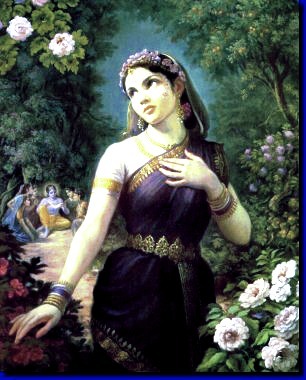 Radha though is not a woman but is the manifestation of Krishna-bhakti . In response to the question, “How devoted should one be?”‘ the Naradbhaktisutra writes, “Like the Gopis (Cowherd Girls) of Vraj.” In reality , these Gopis are incarnations of Rishis. Much thanks to Jake Murray for bringing my attention to Krishna’s Song.